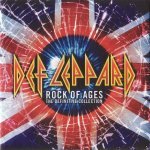 Def Leppard played a show on the Rock Of Ages tour in St. Paul, MN on 29th July 2005 and a fan review was sent in by Penny. The show took place at the Midway Stadium. Four other fan reviews are available from this show. "Def Leppard well they completely did their job of draining me of any and all energy at the end of the show. They all look great as usual, like Sav in white, looked good. Told us we are number 2 for places to play and I don't believe he says that at every show!."